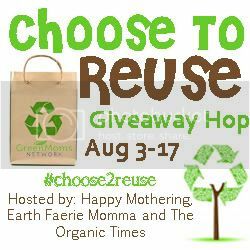 We would love for you to help get the word out about the Choose to Reuse Giveaway Hop. Please put the event button on your sidebar or on your events page. Please take a minute to write a quick blog post about this great event and directing other bloggers to come sign up for the event here. The more the merrier! If you just can’t squeeze a post onto your blogging schedule right now, it would be great if you could promote the event on Facebook and/or Twitter. The more people we can draw in the hop, the bigger the growth we see can in readership! And who doesn’t love creatively made Eco-friendly products!?! 2. Add your blog to the linky. 3. Grab one of the buttons below. 5. 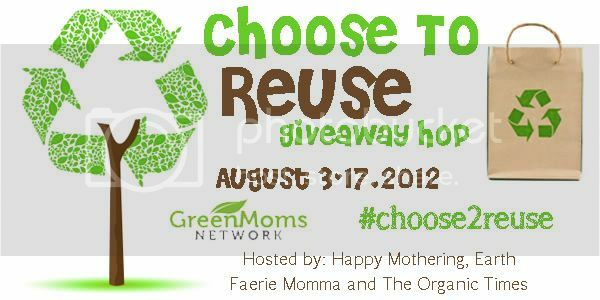 Join the Green Moms Network Facebook Group. Thank you and we look forward to a great event!